The editors of the Icelandic Web of Science and Midjan have recently signed an agreement that allows Midjan to publish articles from the Icelandic Web of Science. The main goal of the contract is to offer hight quality science articles to a broader public. Midjan.is is a new Icelandic website that focuses on culture, media, technology and science. The Icelandic Web of Science was founded in the year 2000. It is among the top 15-20 most popular websites in Iceland. Answers on the Icelandic Web of Science are mainly in Icelandic but material in English is also available, especially answers that relate to Iceland and are of interest to foreign readers. This includes for example Icelandic nature, history or literature. 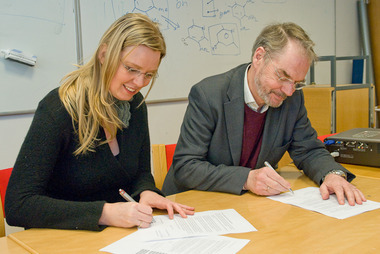 Bryndis Isfold Hlodversdottir, the editor of Midjan, and Thorsteinn Vilhjalmsson, the main editor of The Icelandic Web of Science, sign the agreement. Ritstjórn Vísindavefsins. „The Icelandic Web of Science in co-operation with Midjan“. The Icelandic Web of Science 14.1.2010. http://why.is/svar.php?id=70813. (Skoðað 21.4.2019).